And there are plenty of shows returning to Lifetime in January 2019. Married At First Sight, The Rap Game, and Bring It will be blessing us with some new episodes next year. After the end of a rough time on Real Housewives of Beverly Hills, I’m pretty surprised Yolanda Hadid would want to return to reality TV. Then again, she is going to star in a show about models and their moms, so that seems like a pretty cushy deal for her to pass up. Unless you’ve been living under a rock, you know that Yolanda is the mom to supermodels Gigi Hadid and Bella Hadid. Her son Anwar Hadid has also started modeling. I’m sure he will reach supermodel status as well. This seems like a way better fit for Yolanda than arguing with women at dinner parties and being forced to prove that she has a chronic illness. Terra Jole Gets a ‘Little Women: LA’ Spinoff: ‘Terra’s Little Family’ Premieres on Lifetime April 8! Terra Jole is taking her pregnancy, and her drama, to a new series that will revolve exclusively around…who else? HER! 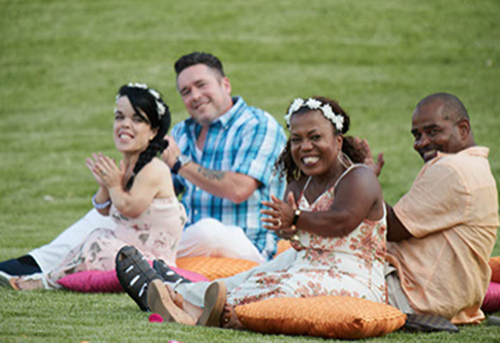 Little Women: Terra’s Little Family, which premieres April 8 on Lifetime, will document Terra Jole’s high risk pregnancy in near real-time footage (aka: Tori & Dean style) leading up to the baby’s delivery. The show will also look back on the ups and downs of Terra’s pregnancy, as documented largely on Little Women LA. On this season’s LWLA – finale coming this Wednesday! – Terra and Joe Gnoffo have had cameras following them into doctor’s appointments and social situations that have tested their relationship and exposed the health risks of Little Person pregnancy. Facing serious concerns like the high risk of having a double-dominant child (a condition in which double-dominant dwarfism genes prove fatal for a newborn), Terra and Joe will take us through the last months of her pregnancy via 10 episodes. Coming soon to a TV near you.. Prison Wives Club! Yea! It's OVER! How I've missed you, Jeff Collins. Lookatcha! He's got a fresh new hairstyle (not to mention new color) and a sleeker, hipper suit than in Dance Moms reunions past. He's also cracking jokes as he introduces Hurricane Abby Lee Miller. He begins the evening by showing the Christi/Leslie smack down on Burboun Street, and Abby admonishes them for the trash they are. It is no way to represent the Abby Lee Dance Company. Original Extra Crispy Christi and Leslie come out to share their side of the brawl. Christi has a prepared speech where she takes responsibility for her actions while reminding everyone that Leslie has a history of violence. Leslie talks only about her loyalty to her daughters and Abby and how she wants to make a name for her girls in the entertainment industry. She doesn't understand why Christi is so threatened by her. Oh, she's making a name for her poor girls alright (and so is Christi! ).